The LRP5 gene correlates with pulmonary fibrosis severity. 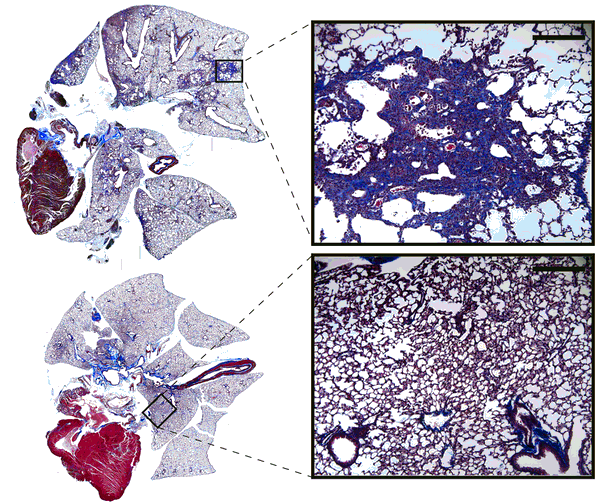 Staining of diseased lungs in mouse models with (top) and without (bottom) the Lrp5 protein. Northwestern Medicine scientists have identified a pathway for treating a fatal lung disease that currently has no cure. Idiopathic pulmonary fibrosis (IPF) affects 5 million people worldwide. It occurs when lung tissue scars and stiffens, making it difficult to breathe. “Idiopathic” means the cause of the chronic disease is unclear. In a study recently published in the American Journal of Respiratory and Critical Medicine, scientists focused on a pathway called Wnt/beta-catenin that, among its many roles, is known to be critical in normal fetal development. Previous research revealed similarities between the gene expression of developing lungs and IPF lungs. Anna Lam, MD, ’03, ’04, ’07 GME, assistant professor in Medicine-Pulmonary and Critical Care, Cara Gottardi, PhD, associate professor in Medicine-Pulmonary and Critical Care and their colleagues analyzed bloods cells from patients with the disease. “We found that expression of genes in the Wnt/beta-catenin pathway in circulating blood cells correlated with disease progression and severity,” said Dr. Lam, first author of the study. 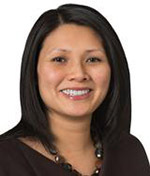 Anna Lam, MD, ’03, ’04, ’07 GME, assistant professor in Medicine-Pulmonary and Critical Care hopes to use this study to identify patients at risk for severe idiopathic pulmonary fibrosis. Specifically, they discovered that overexpression of several genes in the pathway – LRP5 and LRP6 in particular – was associated with progression of IPF. Overexpression of LRP5 was also correlated with disease severity and mortality. In mice, loss of LRP5 protected the models from developing the disease. To confirm the findings, the scientists tested a new molecule inhibitor targeting the Wnt/beta-catenin pathway and saw the same results. Previously, the mechanisms that drove Wnt/beta-catenin signaling were unknown, as was the extent that the pathway predicted outcomes for IPF patients. This study was supported by NIH grants K08HL093216, P30HL101292, HL095397, GM076561 and HL094643, in addition to Department of Defense grant W81XWH-12-1-0471. For more information about treating pulmonary fibrosis, contact the Interstitial Diseases and Pulmonary Fibrosis Program at Northwestern Medicine.